Designed to accommodate extra-thick counters, this Purist kitchen faucet combines a strong architectural form and simple-to-use features. The high-arch swing spout maneuvers easily around large cookware, while the side lever handle controls temperature and flow. Bring elegant, minimalist style to your contemporary decor with this Evoke kitchen sink faucet. The high spout rotates 360 degrees for full clearance and coverage. Offering flexibility for a variety of tasks, the pull-out sprayhead provides three functions, including pause, so you can easily move inside and outside of the sink. Purist Primary Single Hole 1-Handle Kitchen Faucet In Polished Chrome Designed to accommodate extra-thick counters, this Purist kitchen faucet combines a strong architectural form and simple-to-use features. The high-arch swing spout maneuvers easily around large cookware, while the side lever handle controls temperature and flow. 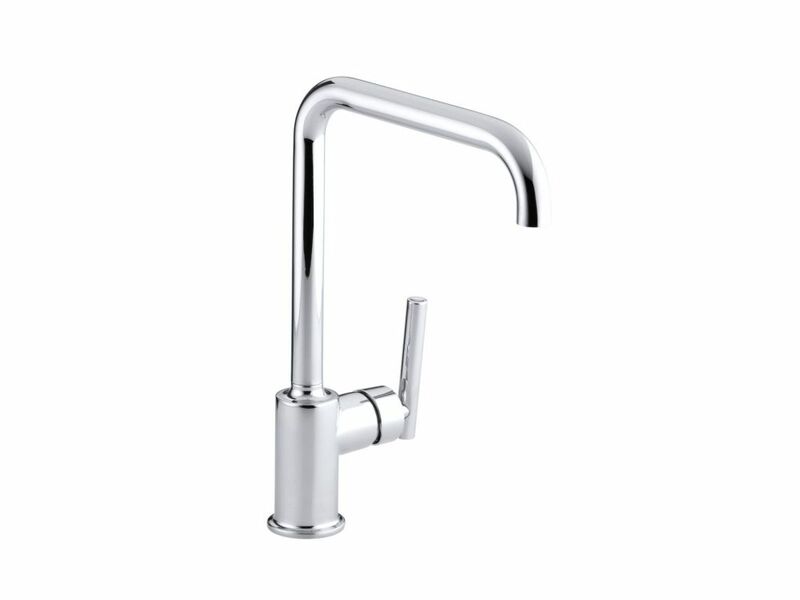 Purist Primary Single Hole 1-Handle Kitchen Faucet In Polished Chrome is rated 5.0 out of 5 by 1. Rated 5 out of 5 by zuidy from Fabulously Designed Faucet I had been looking for weeks for a bathroom faucet to go with a Kohler vessel style sink. Even though this is labeled a kitchen faucet, it had the height and reach I was looking for to complete my bathroom project. This was my first time installing a new counter top, sink, and faucet. It could not have been easier. The only problem I encountered was not anticipating the changes needed for the drain. A simple trip to Home Depot and their plumbing guy walked me through making the changes and even took the parts out and assembled them for me. All I had to do was cut it to the length I needed. One of the best things about this faucet was the ability to install it so the faucet handle was on the left, instead of the right. Another selling point is that having the handle on the side means no drips and water spots on the faucet, it always looks clean, shiny, and beautiful!